Kudos to those of you who guessed correctly that the picture on my most recent blog post was…coffee! Ripe, luscious, high grown Sumatra Mandheling arabica coffee. 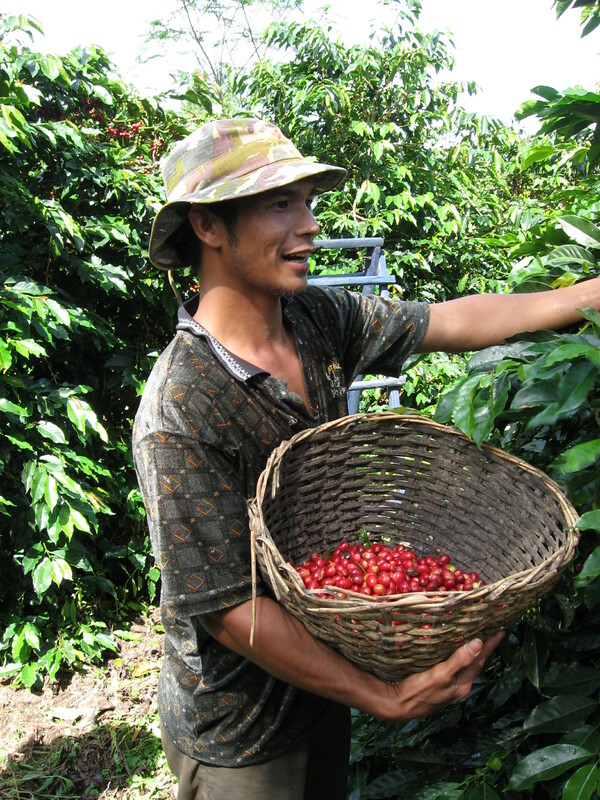 pick the ripest, reddest coffee cherries. This means that he has to pick each of his coffee bushes at least 3-4 times per harvest because mother nature doesn’t operate like a factory. Each bean takes its own sweet time to ripen! Gani inherited the farm from his parents and some of his coffee bushes are 100 years old! He farms his piece of land with minimal mechanization, using organic practices (no artificial fertilizer, no pesticides), meaning that he has to take care of weeds and pests with a combination of his own physical work and the use of natural fertilizer and pesticides. It’s honest to goodness back breaking hard work that Gani does all around the year before he can get those beautiful little red orbs to harvest. 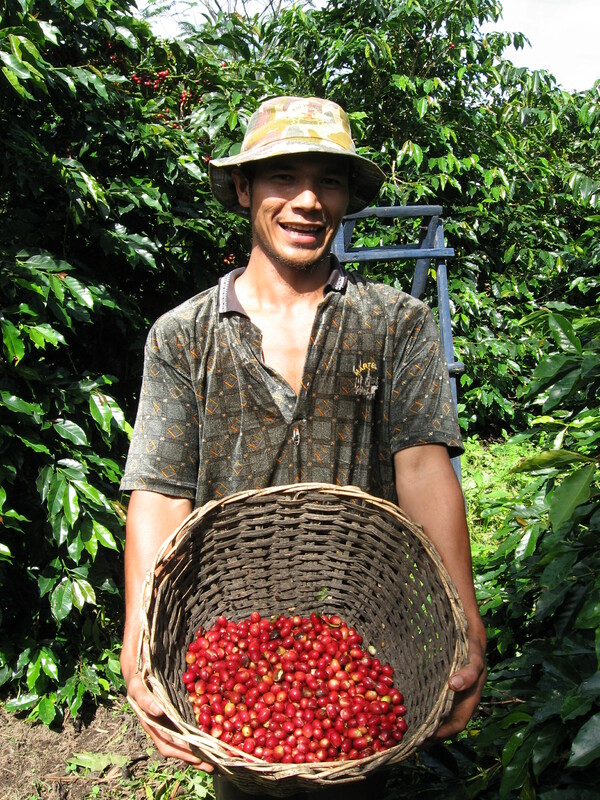 And after much picking, he gets a nice batch of yummy looking coffee cherries (they really are yummy-I’ve tried some!). 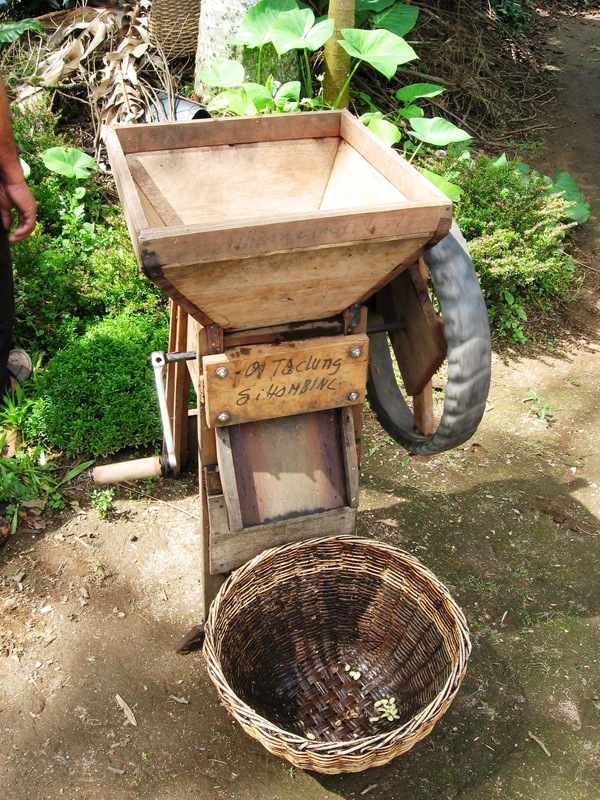 then he uses a hand-kranked huller to separate the coffee bean from the cherry. 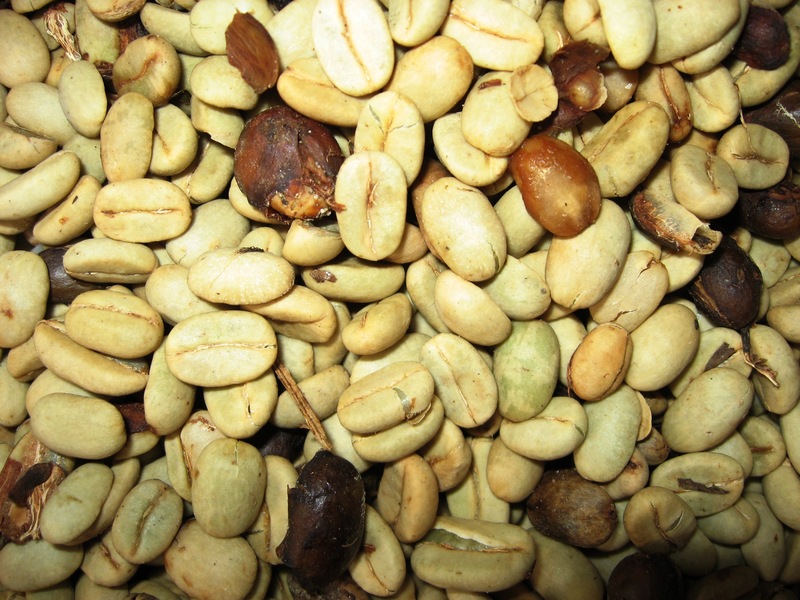 Yes, that’s right, the coffee bean is the seed of the coffee cherry. Actually, it’s two seeds-each cherry contains 2 beans. At this stage the beans are covered in a papery film, so the coffee is called ‘parchment coffee’. After a day or so the beans will be washed and the parchment taken off. 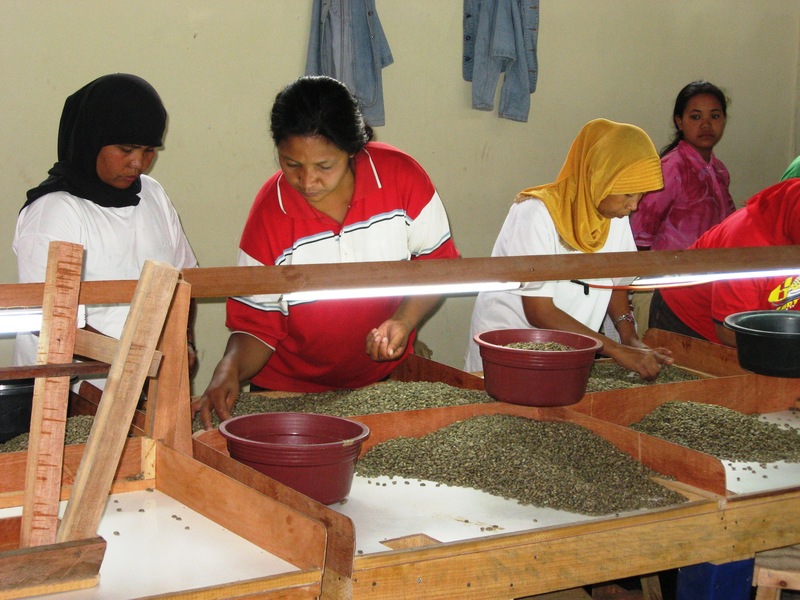 Next beans (now called green beans) will be dried by Gani until they lose some of their moisture content, and then further by the exporter who buys the coffee from Gani. Next, Gani will (depending on the situation) either sell the beans to a middleman who will then sell to an exporter, or he will sell the beans directly to an exporter. He may decide to sell the beans collectively with other coffee farmers so they can get a better price for more volume, and because they are all bargaining together. The exporter will dry the beans even more (but not too much or you won’t like the result). At this point a bunch of typical green coffee beans looks pretty much like this. 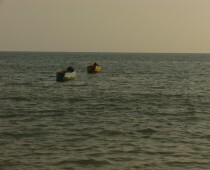 See the brown/black ones? And the one on the lower left that looks like it’s a bit broken? Since the coffee hasn’t been roasted yet, you can safely assume that the brown bits aren’t roasted coffee-it’s green coffee beans that are a bit or a lot rotten (sigh-mother nature isn’t perfect) and they need to go or your coffee will taste, well, not a lovely as it should. So, the exporter takes a batch and does triage. That’s me on the left learning how to do triage. Sounds like the ER, right? Well, triage in an ER means sorting out the worst cases to determine priority for treatment. So, triage in coffee means, sorting out the worst beans. 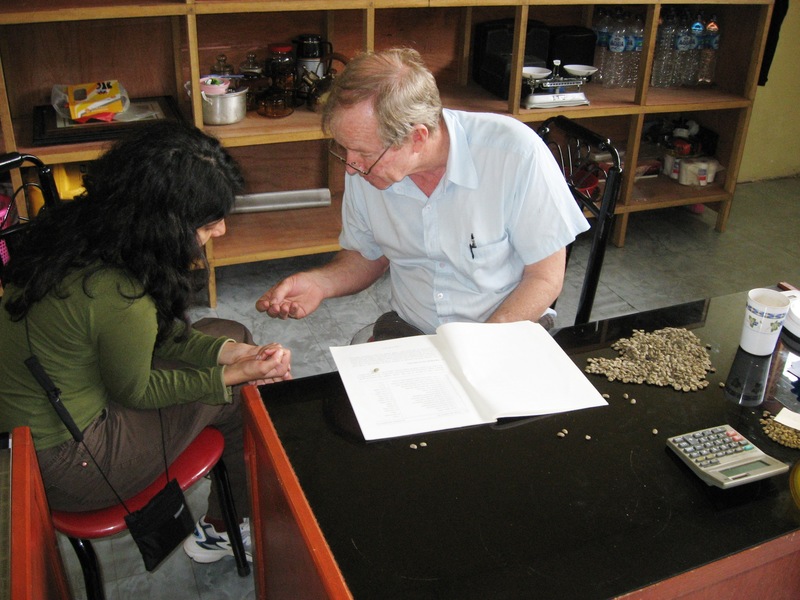 The exporter showed me a list of descriptions of defective coffee beans that he used as a reference to sort out the good beans from the bad. He samples a batch of coffee he has bought and does a triage to see how many bad coffee beans there are, so he can figure out how long it’s going to take a person sorting the bad beans out to work on that particular batch. He may also give a particularly challenging batch to a more experienced sorter. and then the sorters sort the coffee. Depending on how particular the importer is the coffee may be sorted another couple of times, or this may be it. The exporter may then roast a small batch of the sorted coffee and do a tasting to make sure it’s good stuff. (That’s not the exporter in the picture-it’s me and my friend Xavier who were visiting the exporter. Hey, it was our job). The little saucers on the blue paper contain the roasted coffee, which you have to look at and smell to make sure it’s good. Each saucer has a different batch of coffee. 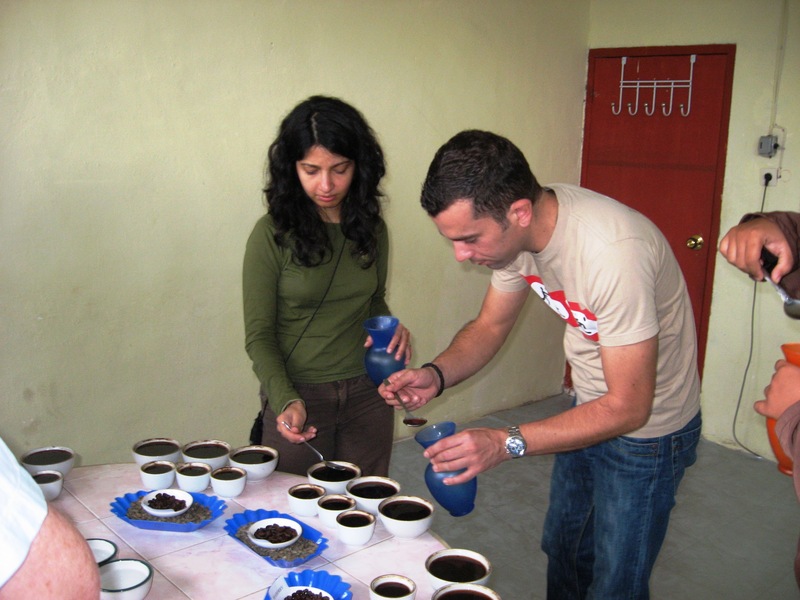 Each batch of beans is brewed and the brew poured into cups. Here you see that each brewed batch has been poured into 6 cups. Every coffee tasting I’ve ever had has included at least 3 cups of each coffee. To taste the coffee, you dip your spoon into cup #1, slurp as rudely as you can, keep slurping while the coffee is in your mouth, and then spit! Then you quickly repeat with #2 and 3 (or in this case also #4, 5 and 6). Pay attention to the flavors and senses the coffee has in your mouth and your nose. It’s amazing how different each small batch of coffee tastes. I’ve tasted notes of cocoa, spices, berries, you name it. Well, and in particularly nasty batches I’ve also tasted/smelled mold, dirt, and stale tobacco. Blech! Aren’t you glad that someone checks and sorts out the yucky stuff for you? So, after the exporters know they’ve got the good stuff they package the coffee, make a deal for it with the importer, and ship it out. Yes, most of the coffee that is exported in this world is still green beans. The roasting I mentioned before was only for testing, remember? 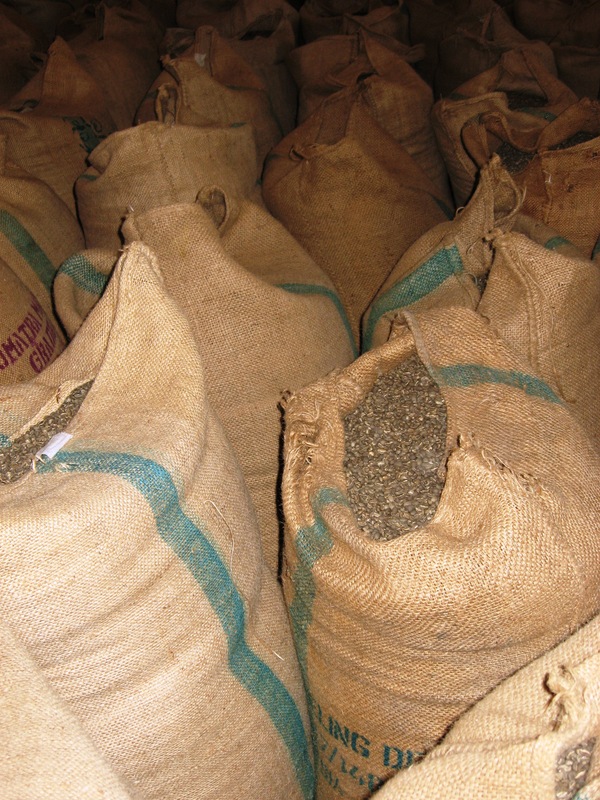 After the importer buys the coffee, they may roast it and sell it themselves, or they may wholesale the beans to coffee businesses that roast them. Phew, I’m exhausted just writing this post. So, tell me now. When you buy your daily latte, how much of that 3-4 bucks goes to my friend Gani? Is it still possible to stay at Gani’s eco-tourism/coffee home stay? I will be in Northern Sumatra in March, and from what you’ve said it sounds like the perfect place. Thanks for asking. I think it should be possible to stay at Gani’s. Will you be going around the Lake Toba region? Gani’s village is just a few hours away from there. I’ve asked Gani for the details and will get back to you asap.